The Kotychi – Strofylia National Wetlands Park is internationally significant for birds, which are amongst the most valuable elements of the natural environment and indicators of the ecosystems’ health, the condition of the various habitats to which they have adapted tolive, as well as the quality of life. Amongst the 442 bird species that are found in Greece, 261 have been observed in the area (approximately 59 %). 79 of these are species of priority for the European Union in accordance with Annex Ι in Directive 2009/147/ΕΚ (to date 79/409/EEC), while 40 species have been classified under one of the risk categories in the Red Book of Endangered Vertebrates in Greece. The area’s importance for several breeding species is also extremely significant. 23 of the species that nest have been included in Annex Ι under Directive 2009/147/EC, which also includes globally threatened species such as the Ferruginous duck (Aythyanyroca) and the Common Kestrel (Falco naumanni). The huge diversity of habitats combined with other biotic and abiotic factors (climate, soil, etc.) are the main reason for the existence of a huge variety of avifauna species. This diversity becomes even more apparent between the seasons, whereby excluding the permanent residents living in the area, there are those that visit it during their journey to the northern (Spring migration) or southern (Autumn migration) areas, as well as those travelling to the area to nest or winter (hibernation). 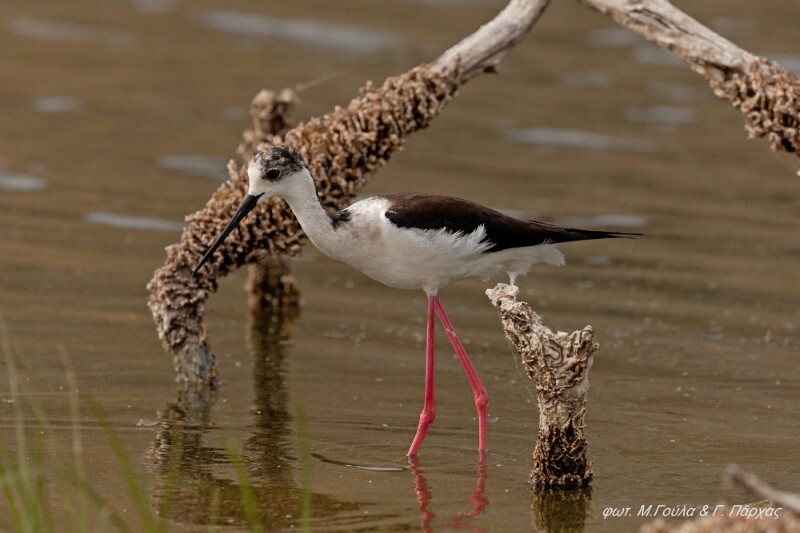 Spring migration commences in February for species such as the ruff (Philomachus pugnax), glossy ibis (Plegadis falcinellus), garganey (Anas querquedula) and the black-tailed godwit (Limosa limosa) and continues until May or early June. It is a mass migration and more impressive than the Autumn migration with many species passing through in large numbers, including the black-winged stilt (Himantopus himantopus), little stint (Calidris minuta), curlew sandpiper (Calidris ferruginea), Kentish plover (Charadrius alexandrinus), garganey (Anas querquedula) and various Tringae like the marsh sandpiper (Tringa stagnatilis), wood sandpiper (Tringa glareola) and common greenshank (Tringa nebularia). The most important species that migrate to the region for nesting, which highlights its value, include the little bittern (Ixobrychus minutus), purple heron (Ardea purpurea), garganey (Anas querquedula), short-toed snake eagle (Circaetus gallicus), Common Kestrel ( Falco naumanni), black-winged stilt (Himantopus himantopus), common pratincole (Glareola pratincola), little tern (Sterna albifrons), European nightjar (Caprimulgus europaeus), greater short-toed lark (Calandrella brachydactyla), etc. It is worth mentioning that in 2010, a pair of white storks (Ciconia ciconia) built the nest in the town of Metochi, which generated intense interest, since this was the first time in decades that the specific species had nested in the Peloponnese. The period between November and February has been designated as the hibernation period in the region. Several species of birds migrate from northern Europe to the Mediterranean during this period to better source food. The onset of migration amongst the aquatic species varies in accordance with the species, while the size of the migrating populations is dependent upon the severity of the winter in northern Europe. The species that winter in the area include the common shelduck (Tadorna tadorna), northern pintail (Anas acuta), northern shoveler (Anas clypeata), Eurasian widgeon (Anas penelope), Eurasian teal (Anas crecca), common pochard (Aythya ferina), European golden plover (Pluvialis apricaria), northern lapwing (Vanellus vanellus), etc. Furthermore, the number of species that live in the region all year round significantly increases during the wintering season and include the little grebe (Tachybaptus ruficollis), great egret (Ardea alba), grey heron (Ardea cinerea), mallard (Anas platyrhynchos), ferruginous duck (Aythya nyroca), western marsh harrier (Circus aeruginosus), common moorhen or swamp chicken (Gallinula chloropus), Eurasian coot (Fulica atra) etc. Is located upon the imaginary Western migration route that follows the west coast of Greece from Albania to the Methoni peninsula (Messenia) and which continues for migratory birds by direct diffusion into the Mediterranean Sea or continues on to Kithira, Antikythira and Crete. With the exception of the “advance station” at Yalova lagoon in Pylos, Kotychi is the last and conversely the first in a series of significant wetlands of international significance along the western coasts of the Balkans from Dalmatia to the Southern Peloponnese (Neretva, Hutovo Blato, Skadar Lake, Drini Delta, Kalama Delta, Ambrakikos and Messolonghi). It is the only Wetlands of International Significance under the Ramsar Convention in the Peloponnese geographical district. 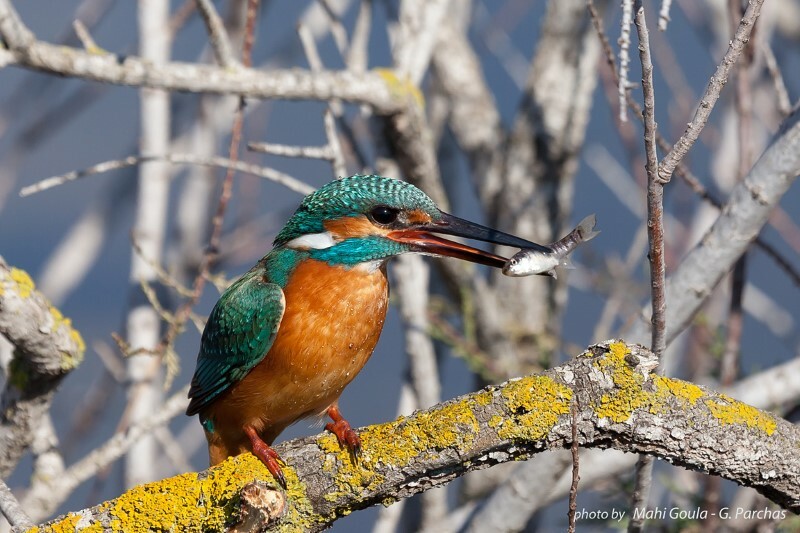 The huge diversity of its wetlands and terrestrial ecosystems creates a unique combination in Greece that can accommodate a wide variety of bird species with different requirement (aquatic, woodland and migratory). The wintering conditions for the birds are favourable due to the mild winter. The wetland complex from Araxos lagoon to Kotychi is a natural continuation to the south of the very significant wetland complex of the Messolonghi, Aitolikon and Acheloos Delta wetlands. 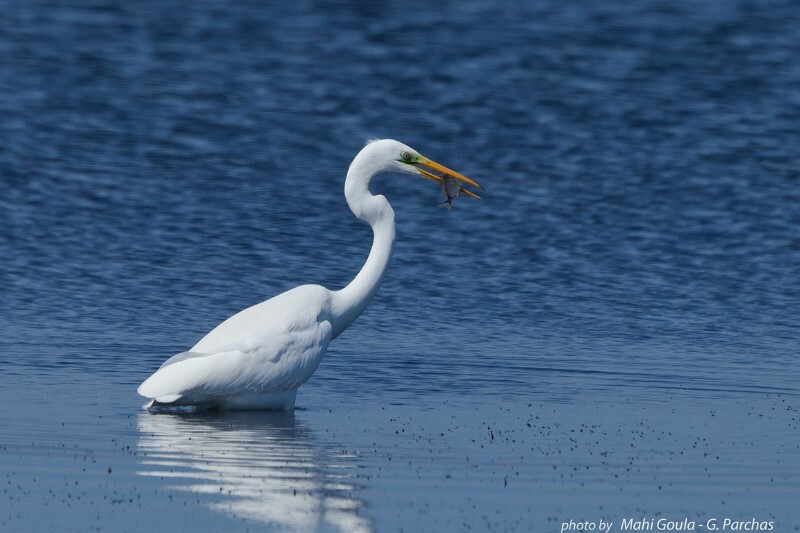 It hosts nine (9) different species of herons in large numbers throughout the year, of which seven (7) are priority species. It is one of the leading places in Greece for finding migratory wading birds, especially during spring and autumn. It is of National significance for the nesting of the little bittern (Ixobrychus minutes), which is found in the region’s extensive reed system and the purple Heron (Ardea purpurea), whose behaviour makes it difficult to observe it. It is an important nesting place for the rare ferruginous duck (Aythya nyroca), which is one of the nine (9) globally threatened species and one of the territory’s most significant places for the reproduction of the black-winged stilt (Himantopus himantopus) with its characteristic and noisy call, the common pratincole (Glareola pratincola) that nests in the open areas near the wetland system and the very small little tern (Sterna albifrons). The town of Lehaina is an observation point for a population of Common Kestrels (Falco naumanni), which nest on rooftops and holes in the walls. 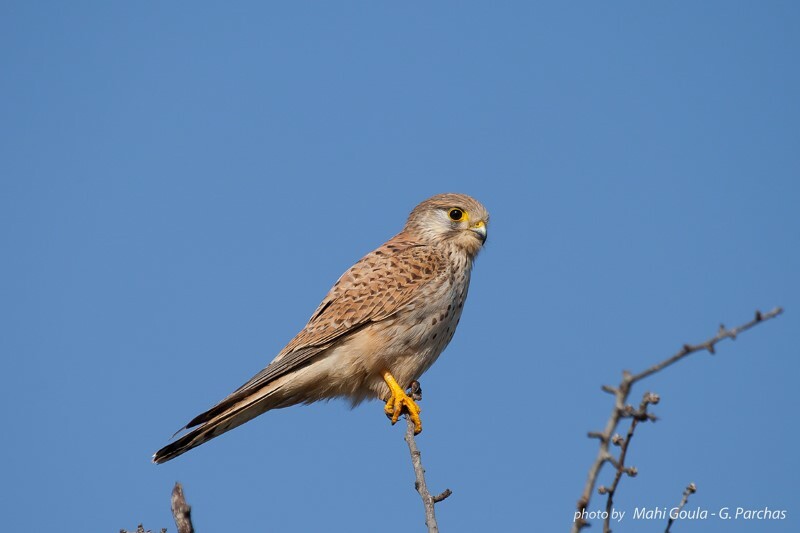 The Common Kestrel is one of the nine (9) globally threatened species. It is one of the best locations in Greece for the Marsh Harrier (Circus aeruginosus) during winter. It is an observation point for unusual European birds like the barn swallow (Hirundo rustica) and the Yellow Wagtail (Motacilla flava) that transforms the Kotychi landscape during winter with its yellow hues. It is a location where rare species like the Cream-colored Courser (Cursorius cursor), Cattle Egret (Bubulcus ibis) and Eurasian Dotterel (Charadrius morinellus) turnout.